Roborovski hamsters live in the wild around the Gobi Desert, throughout Mongolia's desert steppe and parts of northern China. They are particularly suited to the steppe, as they are highly efficient in their use of water (as evidenced by how they may pass particularly concentrated urine), so little vegetation is required. Here, they dig and live in burrows. These are usually steep tunnels and they live between 60 and 200 cm (~24 to 79 inches) below ground. Roborovski hamsters are very curious, easily startled, and generally timid, as well as very active. They also don't speak or squeak as much as most hamster species. For some, if enclosed in a hand, will bite or nip in attempt to escape. (They usually put their hands in the position for eating when they try to bite you! So be alarmed.) Some will even sniff around and nip. These behaviors are rare but possible. They benefit from an enriched environment they can be active in. Roborovskis can be hand-tamed if acquired young and individually accustomed to handling. This requires some patience and time investment, however, since they bite often when angry. A hamster can easily hurt itself escaping or getting into the wrong places before it is caught. It is important to handle them where they cannot get away as they are hard to catch, being both fast and very small, and will not hesitate to wriggle free or jump from their owner's hand if panicked, no matter the distance to the ground. Roborovski hamsters can enjoy being together. Two of these hamsters from different litters may get along if introduced properly, although there is always a chance they may not. It is common for this breed to be extremely vicious, especially with each other. They are very territorial and fights can lead to death. 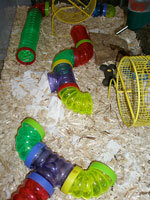 Compatible cage mates will generally play, eat, and sleep together in the same spot. Their antics are constantly entertaining and they make excellent pets for those who want animals that are fun to watch and require less personal handling. 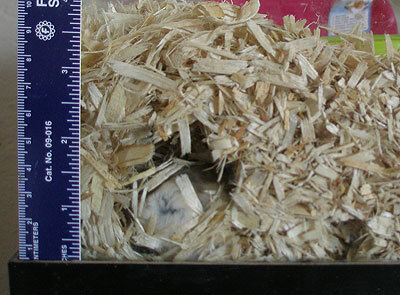 Although generally nocturnal, they are more likely to be active during the day than the more commonly-kept Syrian hamster (Mesocricetus auratus). They do not, however, like direct light or sunlight and will be more confident emerging in the daytime if their home can be kept in relative shade. Like most other small animals, these hamsters cannot see by red light. Therefore, a "fireglow" bulb installed by their cage or tank, though offering little visibility to them, will illuminate their night-time behavior for fascinating observation. Roborovski hamsters have been reported running up to 20 miles a night in about 8 and a half hours.Robo Dwarf hamsters make a good pet. Many types of housing is available at pet stores, however the best option is an aquarium with a wire mesh top. Plastic enclosures can retain hamster waste fumes, causing respiratory problems. Wire cages often have openings large enough for these tiny hamsters to squeeze through. To adopt a Roborovski Dwarf Hamster, check with your local shelter or rescue group first. Just like cats and dogs, you can rescue a hamster that needs a home and have one of the cutest pets available.